This is for you, the one who is afraid of pie. Making brown sugar peach pie bars in a cake pan is way easier, no crimping of the crust and they still come out amazing!! What could scream summer more than a Brown Sugar Peach Pie Bars recipe?! And it’s pretty. Obviously Cade is not writing this post. I can’t really see him saying that, haha. But aren’t they?! I mean, look at those vibrant, juicy peaches with a little red, maroon, and purple poking through. And that crumble topping along with a flaky pie crust? Hello bathing suits, bbqs and lots of people you love. Fresh Peaches from Allred’s Farm was a big deal at my house as a kid. Peaches need more sunshine than Vancouver, Washington sometimes offered, but we still got fantastic peaches by late summer, early fall. We loved when Mom came home with buckets full, not only because it was time to can peaches as a family, but because of the fresh peaches to enjoy! 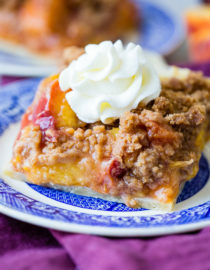 Wanting to know what is the best peach pie recipe? I think it’s this one! 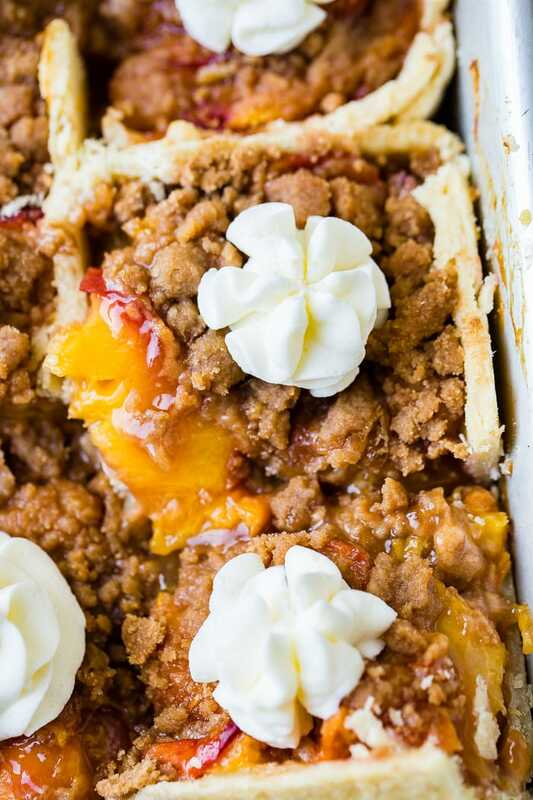 I know it’s in bar form, but put it in a pie dish and either use the dough on top or the crumble and you’ve got the BEST peach pie recipe out there. But truth be told, there’s another peach pie that is truly my favorite and another that’s a must try as well. 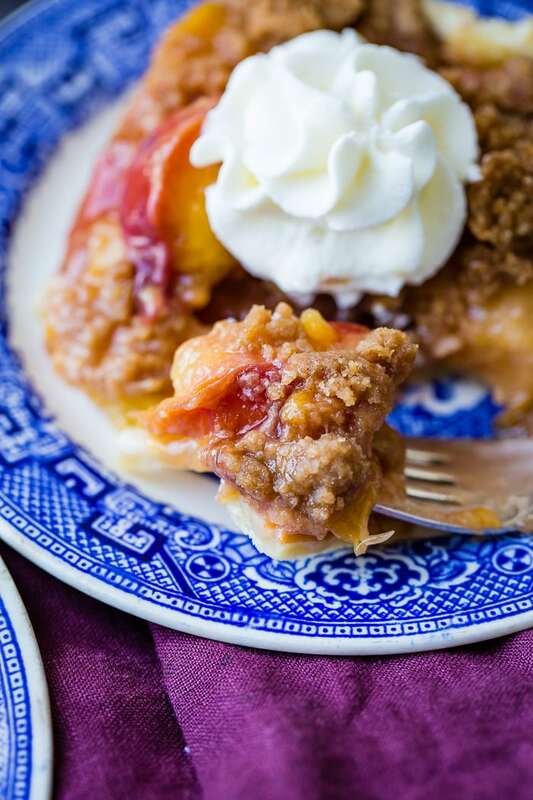 Sour Cream Peach Pie is one of the best fruit pie recipes I’ve ever had or made. 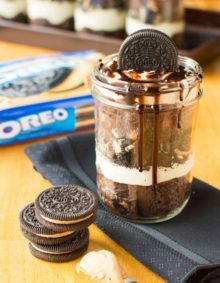 That topping should look familiar but the filling is completely different and oh so magical. And then there’s a Lemon Jello Peach Pie. It’s so fresh and light you can’t help but feel like you can eat another slice and it won’t add to your waistline. 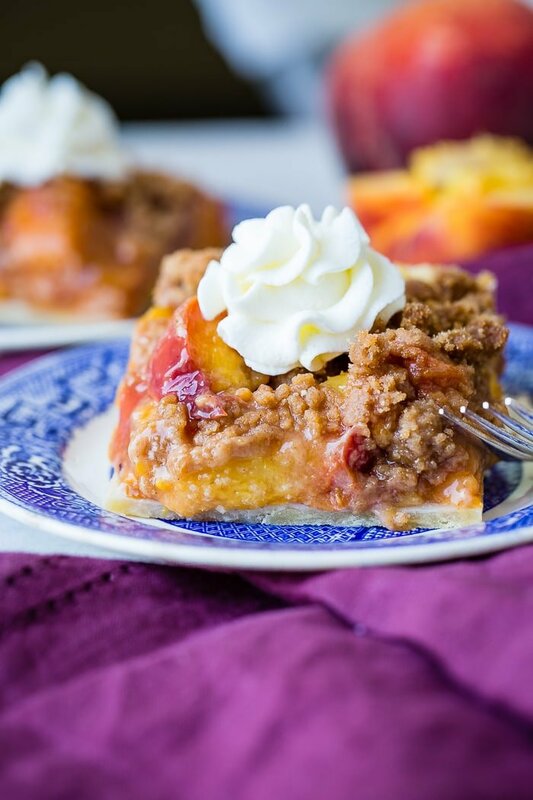 Peach cobbler pie is a mash up of two different recipes. I’d say this Brown Sugar Peach Pie Bars recipe isn’t as much a peach cobbler pie only because the topping tastes a little more like a crisp, minus the oats. 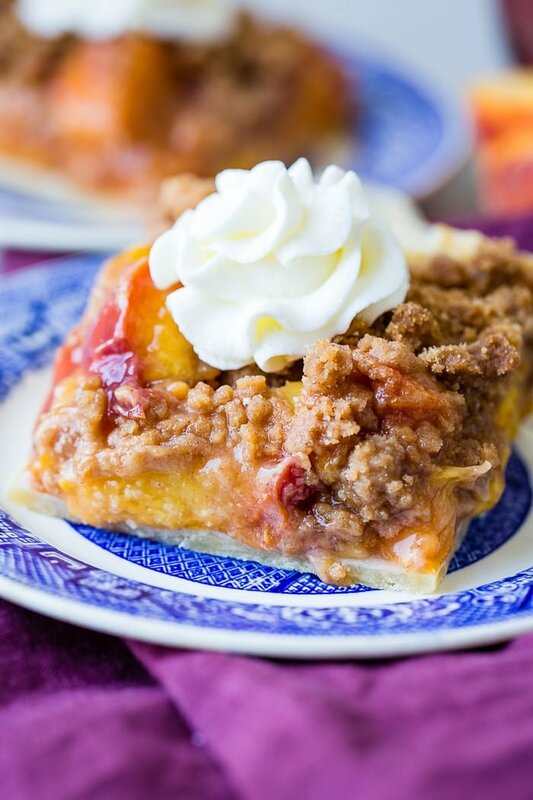 A peach cobbler pie is usually the base of a peach pie and then the topping is that of a peach cobbler. If you’d like to try that recipe as well we would be happy to make one and share it. Just let us know in the comments below. Peach pie and brown sugar peach pie bars don’t bake at the some temperature as some other pies, you’re going to go for a nice, high heat to really cook up those peaches into a thickened filling and crisp up the topping. Start by preheating your oven to 400 degrees, then get out a little foil in order to cover the edges if they begin to brown too much. Peach pie filling often ends up runny and bland. That’s because the filling wasn’t properly made before adding it to the pie crust. 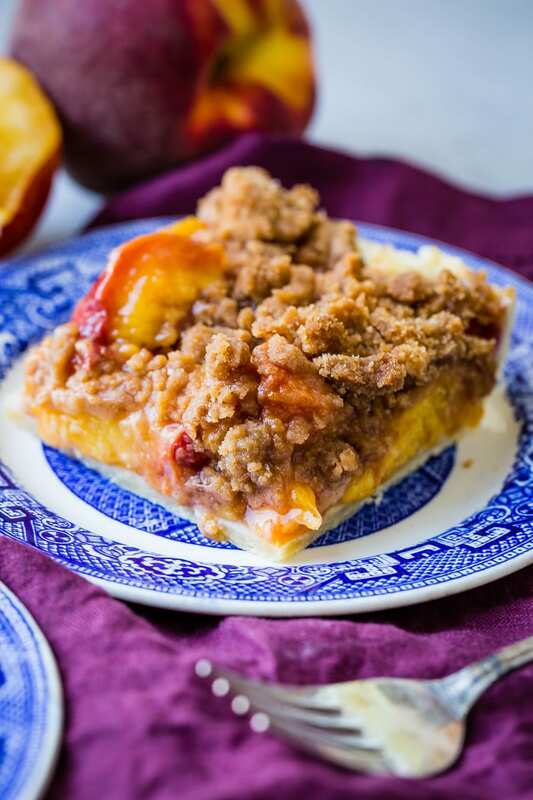 We found there are a couple of contributing factors in making a perfect peach pie filling, or in this case, peach pie bars filling. Don’t use flour-Let’s just put down the flour and walk away now. It leads to results that vary and almost always a slightly flour-y taste. Cut the peaches into thicker slices, or you can even cut into bigger chunks so that there’s more texture and the peaches don’t break down as quickly. Finally, let that filling cool in the fridge for at least 3 hours. Peach pie and really any fruit pie is best made the morning of or I always do the day before serving. Patience is necessary, even if I hate it. I’m going to chat about how to peel peaches, but do you have to peel peaches for peach pie? Are you supposed to peel peaches ever? I’d say that more than 70% of the time I peel half of the peaches and leave the other half. It’s not too much peel, but it also adds more color to the dish, as you can see in these photos. Now if you have time and don’t want peels, no worries! Here’s how to peel peaches. Place the whole peach in the water using a slotted spoon to gently lower it into the pot. Using a paring knife, gently remove the skins and slice. Can you peel a peach without boiling it? Well, I try to do this every single time and yes, sometimes it’s successful, but too often it’s not. Just boil those darn peaches. Peach pie sitting on the counter will only last for about 2 days, but you pop that baby in the fridge and you just extended to 4-5 days, so winning!! Peach pie bars filling can be frozen, but make sure you have cooled it completely before doing that. You’ll also want to place it in a freezer bag or as always, we use our food saver because it’s awesome. 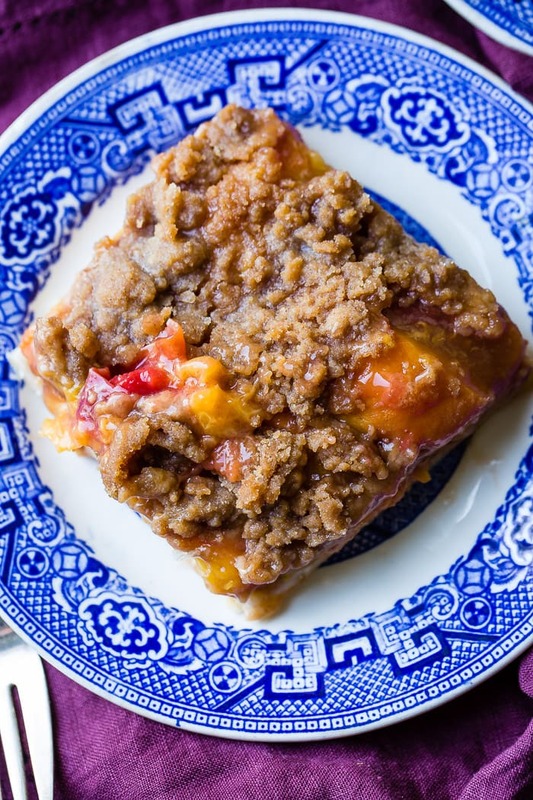 Can You Freeze Peach Pie Bars? This is a tricky one, because we have tested and these brown sugar peach pie bars actually held up really well in the freezer, but they weren’t as crisp as fresh since that topping got a little soggy. If you needed to make it ahead there’s a way to do that, but once cooked, I’d only freeze brown sugar peach pie bars for no more than a week. If you absolutely must make brown sugar peach pie bars more than 24 hours in advance you have two options. Make the pie crust dough, filling and crumble separate and freeze separately. Allow everything to defrost in the fridge before using. Make the pie portion and freeze it without the crumble on top. Add the crumble to the frozen bars, bake frozen at 425 degrees for 45 minutes, then 30 minutes at 350 degrees or until filling bubbles and crust is brown. Prepare our crust recipe, rolling it out and laying in a 9×13″ baking pan. Trim off any edges that hang out and over the pan. Reserve those for cinnamon sugar pie cookies. Peel the peaches then cut into 2 inch chunks. You’ll need 7 cups. In a large bowl, stir together the peach chunks, brown sugar, ultra gel, lemon juice, and cinnamon together until thoroughly combined. Top with the crumble topping, I like to squeeze it in my hand as I sprinkle it over the fruit so that it cooks in clumps. Bake for 35-45 minutes or until the top is browned, fruit is bubbly and the crust is golden. Place on the counter to cool for 30 minutes then finish cooling in the fridge for 3 hours before slicing. 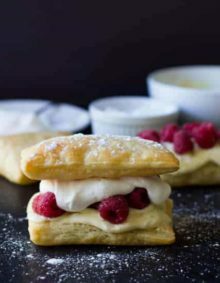 In a bowl, using a pastry cutter or two forks, mix together the topping ingredients, getting in with your hands if needed until it’s like wet sand and clumps together when you squeeze it in your hand. Hoping to make this today. Love peached but have been waiting on a good crop to make the bars. I don’t see in the directions what the egg and 1/2 tsp water/milk are for? Can’t wait to taste this! How in the world did that happen?! It has been fixed. Both of those ingredients should not have been in there. Thank you Lynn! Can you use sure-jell in place of the ultra gel? No, it won’t turn out the same. Use cornstarch instead. I don’t see the note section about the Jel. Help! Looks tasty! 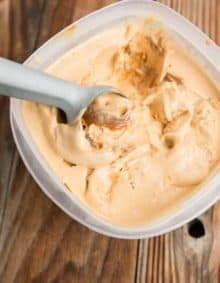 It’s also great with the ice cream scoop topping!